If you needed any reminder of how deep Team Canada’s entry was at this year’s World Juniors, just look at who scored the tournament-winning goal and the added significance behind it. Tyler Steenbergen, who has 86 goals in his last 99 games with the Swift Current Broncos, put Canada ahead with 1:40 left en route to a 3-1 win over Team Sweden in Friday’s gold medal game. Many thought Steenbergen could play a big role for Team Canada given his impressive scoring totals, but before that goal, he was Canada’s only forward without a goal in the tournament and played less and less minutes as it got into medal games. Captain Dillon Dube and Alex Formenton also scored while Tim Soderlund responded with a shorthanded marker for the Swedes. Carter Hart backed the Canadians with 35 saves while Filip Gustavsson, named the tournament’s top goalie after the game, finished with 24. We knew this year’s Team Canada wouldn’t have that clear cut star like previous years when youngsters like Connor McDavid, Dylan Strome and Mitch Marner donned the red and white, but the depth as the collection of talent worked together to earn Canada’s first gold since 2015. As well, Canada collectively led in major team categories like offence (39 goals), defence (11 against), power play (44.83 per cent) and penalty killing (88 per cent). As expected, the Canadians were led offensively by Jordan Kyrou’s 10 points (three goals and seven assists) and Sam Steel’s nine (four goals and five assists), good for fourth and fifth in tournament scoring. Cale Makar earned Canada’s lone spot on the all-star team after leading all defencemen in points with eight (three goals and five assists). He was joined by Gustavsson, Swedish blueliner and projected 2018 NHL Draft first overall pick Rasmus Dahlin and forwards Casey Middlestadt (tournament MVP) and Kieffer Bellows from the United States and Filip Zadina from the Czech Republic, a projected top-five pick in the upcoming NHL Draft. Canada went into the tournament with a few question marks over some of the young players they left off their roster. In a year where there was a lot of high-end 18-year-old talent such as Cody Glass, Owen Tippett, Nick Suzuki and goaltender Michael DiPietro, Canada went with only three 18-year-olds (Formenton, Robert Thomas and Maxime Comtois), but showed all of that veteran experience paid off. 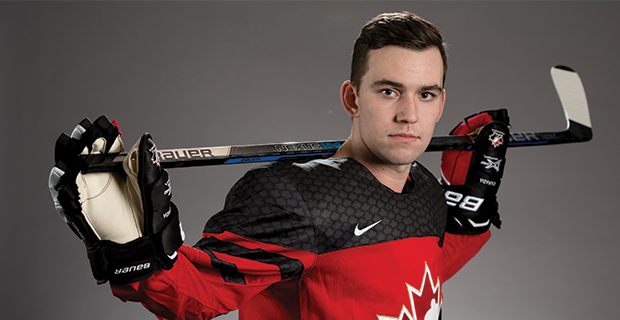 It had to be an especially sweet victory for the seven returning players from last year’s team (Hart, Dube, Taylor Raddysh, Kale Clague, Jake Bean, Michael McLeod and Dante Fabbro) that lost to the United States in a shootout during last year’s final. There were a lot of talking points with this year’s tournament such as the low attendance that drew a lot of criticism over social media and the first ever outdoor game that was stalled and hampered by the snow, but with the tournament now under wraps, there’s something for us to talk about on a positive note: the sight of 22 deserving young men draped in red, white and gold.